9.3 Low deck 4.840 Merlin BB Chevy Block. Camshaft is raised .400 and is set up for Ford Journal cam 2.125 diameter.The block has steel main caps and wide oil pan rails. 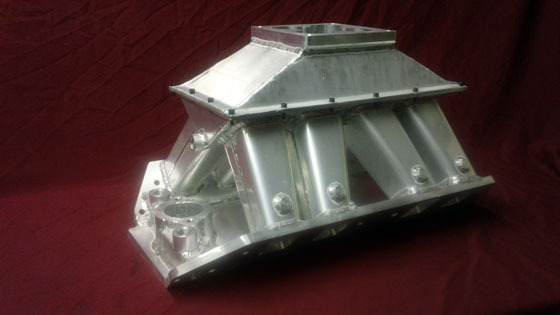 Dart Big Chief Tall Deck 4 Barrel Sheet Metal Intake Manifold. 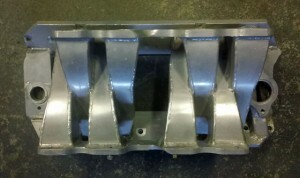 440 Chrysler 577 Sheet Metal Intake Manifold. I started to build this manifold and the customer changed his mind.This manifold will fit a standard deck 440 block with B1 cylinder heads. Will accept any reasonable offer. This is the lower casting for the popular Ferrari 308 turbo kit I built in 1980. The top casting will bolt on after providing clearance for the rear bank fuel rail. We will supply a new fuel pressure regulator. This manifold uses standard mini nozzles and standard electrical connectors for the nozzles. The parts shown will work with any E.F.I. system you have. 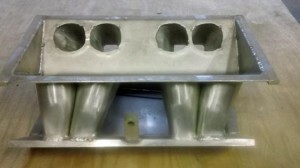 Big Block Chevy Weber Cross Ram Custom Sheet Metal Intake Manifold.This manifold fits a 1968 to 74 Big Block Corvette. 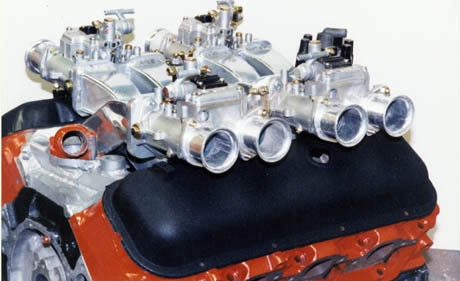 Weber carburetors must be used because of the accelerator pump placement. 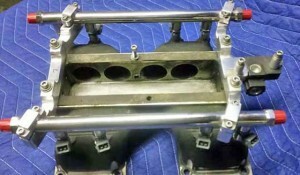 Manifold is sold with out the carburetors. 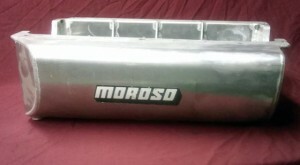 Big Block Chevy Weber Cross Ram Custom Sheet Metal Intake Manifold Top View. This manifold will clear the stock power brake booster. We use either a stock point style distributor or a H.E.I. distributor. The H.E.I. distributor must be clearance d to fit. Our Weber cross ram manifold is built for oval port heads. 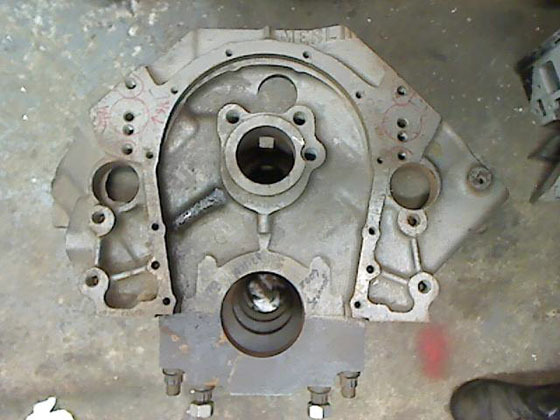 Merlin 3 Big Block Chevy Short Block 565 Cubic Inch. This is standard 9.800 deck Merlin 3 iron block and uses standard Fel Pro or Comectics head gaskets. 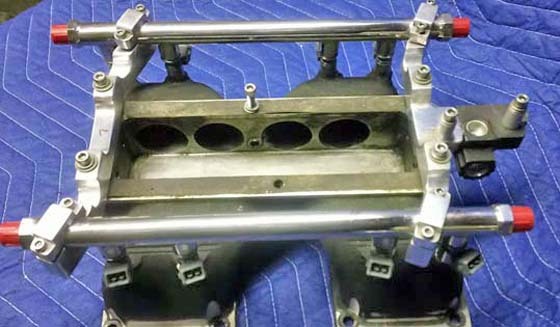 Bore size is 4.600 and the stroke is 4,25 inch.The crankshaft and connecting rods are made by Eagle.This engine has no pistons. A bad nitrous tuneup damaged the pistons. All parts have passed a magnaflux test. None of the cylinders are damaged only need to be finished honed. For Sale Perfect Power P.R.S. 8 E.C.U. Perfect Power P.R.S. 8 E.C.U. For sale brand new Perfect Power PRS8 ECU. This unit is still in the box. We shipped it back to the factory in South Africa($170 freight) because the factory lead technician said it was not working correctly. Our 600 dollar phone bill to South Africa gave us the tech. support neither the U.S. Perfect Power dealer or the U.S distributor could provide. After we installed the PRS8 ecu the car would not start. 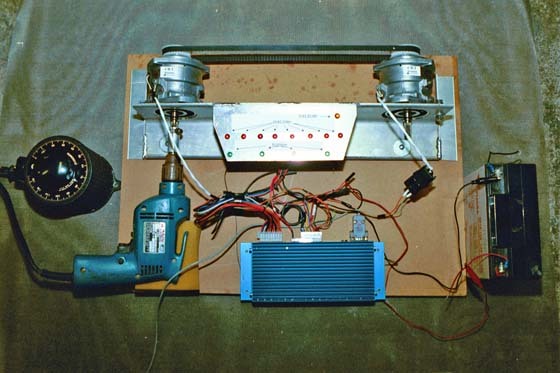 We had to build a test fixture to understand why the car would not start. Perfect Power told us we could use LS1 coils. Our test fixture showed everything worked fine. The Snap On Modus ($8500)said there was 60 mili second coil dwell time under 300 rpm. (engine cranking) The factory said the unit was defective. After inspection the factory told us to change the coils. The factory refused to change the software to reduce the dwell time to 5 mili seconds. We changed E.C.U.’s Our 308 E.FI. turbo dyno test shows a good working E.F.I. system. I would not lie to you. This is an excellent E.CU. If you can spell E.C.U. you can build your own E.F.I. system. The U.S. 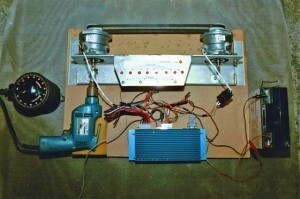 Perfect Power distributor will only charge $5000 for installation. 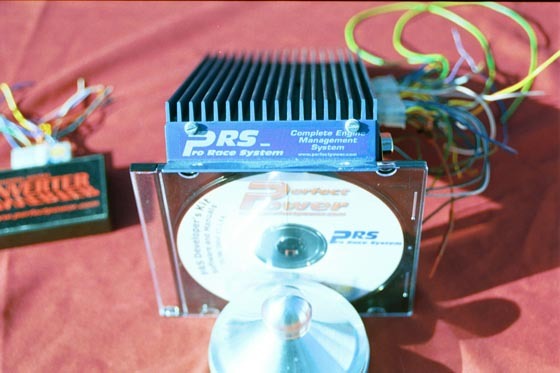 You can buy this PRS 8 ecu for only $1500 cash. The factory installation C.D. and shipping are extra. The wiring harness is extra. I will not provide the South African tech. support phone until you pay me for this E.C.U. Phone rates to Africa are usually less then two dollars a minute.